The Paleolithic, or Old Stone Age, comprises over 99% of human technological history and spans a time range from 2.6 Ma (the earliest recognizable stone tools and archeological record) to 10,000 years ago (the end of the last ice age). There are three major stages of the Paleolithic: (1) The Early Paleolithic which includes: (a) The Oldowan, from 2.6 to about 1.0 Ma, characterized by simple core forms on cobbles and chunks (choppers, discoids, polyhedrons), battered percussors (hammerstones and spheroids), flakes and fragments, and retouched forms such as flake scrapers. Cut marks and fracture patterns on animal bones indicate meat and marrow processing, with the use of simple stone knives and hammers. This stage is associated with the later australopithecines and the earliest forms of the larger-brained genus Homo and documents the first hominid dispersal out of Africa and into Eurasia and (b) The Acheulean, which lasted from approximately 1.7 Ma to 250,000 years ago, and was characterized by large bifaces such as hand axes, cleavers, and picks. The early Acheulean is associated with Homo erectus/ergaster, while the later Acheulean (by ca. 500,000 years ago) is associated with the even larger-brained Homo heidelbergensis. 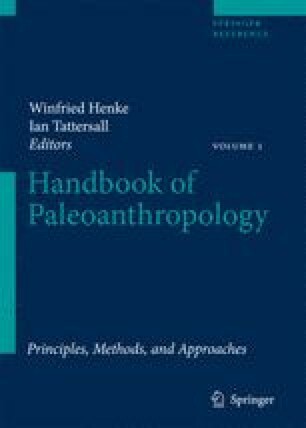 (2) The Middle Paleolithic/Middle Stone Age, from about 250,000 to 30,000 years ago, characterized by a focus on retouched flake tools, such as scrapers, points, and backed knives, and prepared core technologies such as the Levallois method. The controlled production and use of fire appears to be widespread for the first time. This stage is especially associated with archaic forms of Homo sapiens (having modern-size brains but more robust faces and postcranial skeletons), including the Neandertals and the earliest anatomically modern humans. (3) The Late Paleolithic, from 40,000 until 10,000 years ago, characterized by blade tool industries, a proliferation of artifacts in bone, antler, and ivory, and the emergence of rich symbolic art in the form of paintings, engravings, sculpture, and personal body adornment. Early examples of clear architectural structures, musical instruments, and mechanical devices (spear-throwers and bows and arrows) emerge during this time. This stage is especially associated with anatomically modern humans, Homo sapiens sapiens.